Congratulations Mr. February, Harrison Hefele! It is our honor to name you Athlete of the Month. Harrison joined the gym over a year ago. Coach Amanda (then a member) brought him to do “Murph” prior to that and his interest started. 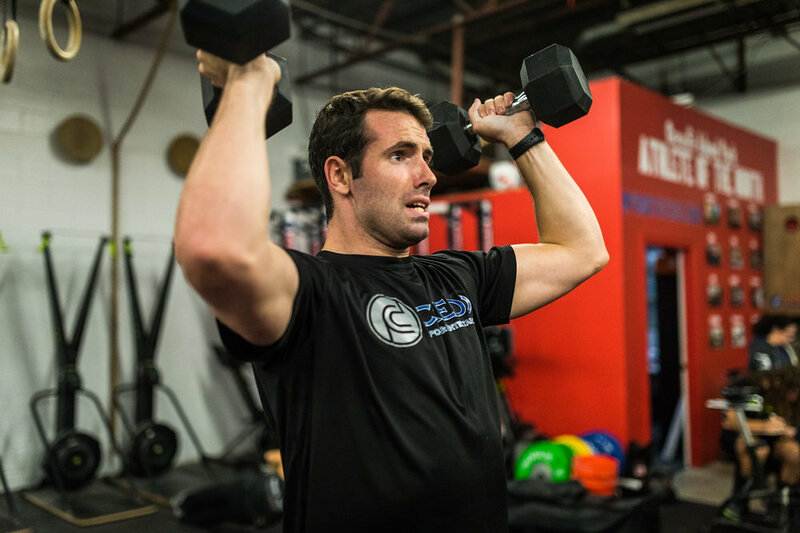 As a former college basketball player and high school lacrosse athlete, Harrison has a competitive edge ingrained in him. He is always looking to improve and loves to learn something new each class he takes. Many of you may know that Harrison is still recovering from a torn ACL while playing basketball. This isn’t his first knee injury and he also isn’t allowing it to stop him from doing what he wants. After multiple conversations with him, I learned how much Harrison loves coming to the gym. He said, “I am in the best all around shape I’ve ever been in.” This of course is different from being in shape for basketball as he would need to be on the court practically every day to be at his best for basketball. It’s pretty cool to have a former athlete like Harrison enjoy the challenge of movements outside his comfort zone (gymnastics.) He’s extra motivated for these since Amanda is a former gymnast and excels as these movements. He’s been a dark horse on the whiteboard as well. Not many saw him posting a top 3 500m Ski time back in January. Being a tall guy, he didn’t realize he was using a 12ft target for wall balls until he was asked why he was using it. That sure made the 10ft target easier. Lastly, a key contribution Harrison has provided has been an app that I use with the coaches and the weightlifting program. It’s called SportsYou. It’s a social media platform made for teams. Keep up the hard work and continue being yourself! Harrison, it’s a pleasure having you in the gym each day and congratulations on being Mr. February. How long have you been a member and how long have you been doing CrossFit? I started Crossfit at Island Park in November of 2017. What is your favorite thing about the gym? The Island Park Gym has built a culture and relationship with their members that reminds me of playing a team sport again. The positivity, advice, encouragement throughout the gym makes it a unique place to be apart of. What is the biggest challenge you have overcome since joining the gym? I'm currently going through a knee injury that I've had twice before. In the past I dreaded these recoveries because it just involved annoying and uncomfortable physical therapy sessions. The coaches have helped my knee get stronger in a shorter period of time. Overall the gym has helped me overcome the physical challenges as well as the mental challenges that come with it. What is your favorite moment at the gym so far? The Friday Night Breast Cancer Awareness workout that the gym held. It was awesome to see an overwhelming amount of support. What's your favorite "cheat" food? Anything deep friend and smothered in cheese. What would you say to someone who is thinking about starting? Go for it. Don't be afraid to expand your comfort zone and try something different. Crossfit has helped me stay in better shape while avoiding injuries that I typically get from playing other sports. The people there are great and only want what's best for you. The knee injuries motivate me to become a better athlete. The injuries also gave me the unique perspective to appreciate every day that I can be active. What is your biggest fitness goal right now? To stay consistent. I would like to be physically fit and active for most of my life. It isn't realistic for me to play basketball much longer but the gym has shown me that age doesn't make a difference. I can't thank the coaches and members at Island Park enough for the constant support and positivity that they exude on a daily basis.